“So far this case shows how ridiculous the new anti-squatting law is. It was badly researched and rushed through parliament based on a hysterical and inaccurate media stereotype. Even the government’s own consultation found that only a few rich landlords saw a need for this law. 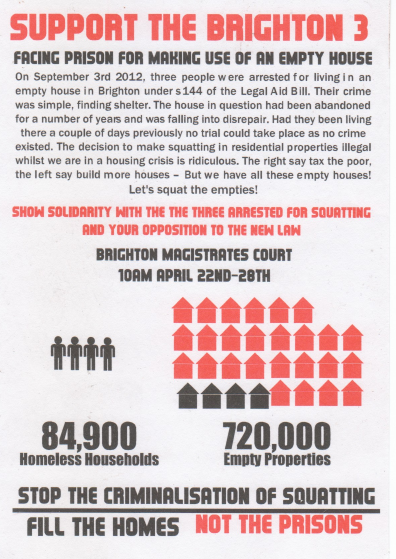 The three defendants are booked in for a two and a half day trial at Brighton Magistrates Court (map) which starts tomorrow at 10am Monday April 22 2013. People will be outside court from 9.30am.